If you’re planning to visit Curaçao in the month of April or beginning of May, and are looking for things to do, then there is no better option than experiencing the national “Seú” parade. After Carnival, Seú is probably the largest cultural manifestation on the island and it’s a celebration that’s deeply rooted in the history of Curaçao and its population. But what does “Seú” mean, and how did this celebration come to exist? Let’s go back in time and find an answer to these questions. The word “Seú” can be traced back to Western Africa, specifically to the country Guinea-Bissau. In the creole language of this country, “Seú” means sky. The sky plays a key role in the celebration of Seú, as it is seen as the home of God, and God is worshipped and thanked for the harvest of each year. There is also an African song dedicated to an African God named “Zeula”. In the song, Zeula is thanked for providing the necessary crops for nutrition. Besides the gratitude offered to the sky and God, the foundation of this celebration lies in the strong believe in mankind’s connection with nature. Seú entails the process of planting, taking care of, and harvesting the crops each year. Therefore, you could say that “Seú” is an agricultural celebration, with clear religious and spiritual aspects. In this sense, the worshipers of “Seú” also believe in the connection with spirits that protect the earth. Earth itself is seemed as sacred, as life is created and preserved through earth. Working on the earth surpasses a form of labor. Rather, it is a ritual that needs to be followed with a lot of care, as it is believed that the success of the harvest is entirely dependent on the way that worshipers treat the earth and the earth spirits. To guarantee a proper use of the earth, and ensure its fertility, the plantation workers sing on the earth and ask the spirits for strength to cultivate the earth without difficulties. Such singing ceremonies always precede the act of planting. In these ceremonies, the rain also plays an important role, and that’s why before the planting season, plantation workers would typically have ceremonies in which they would play the drums, as it is believed that the continuous deep and resonant rumble of the drums attracts the rain. Once these ceremonies have taken place, the planting process can start. The first step is always to ask the spirits for permission to “drecha tera” (fix the earth) to let the earth be renewed and have the necessary strength to carry and grow new seeds. Once the seeds have been planted, the process of “kuida tera” (take care of the earth) takes place until the harvest season. During this period, the values of Seú guide the process of taking care of the earth. These values are: coexistence, cooperation, gratitude, unity and veneration of God. Only by following these values, the community believes that they can achieve the objective of Seú: to thank God for the crops. The very last part is therefore what is known as “Seú”, which is basically a replication of the beginning. The spirits and God are thanked for allowing the earth to produce the crops by. Nowadays the Seú of Curaçao has transformed into a national festivity. It is a cultural manifestation that takes place on the streets, in the form of a parade. But unlike Carnival, where all parade groups have a unique theme, in Seú, all groups maintain the essence of the origin of this agricultural celebration in their costume, and look up to the sky to celebrate the harvest of each year. 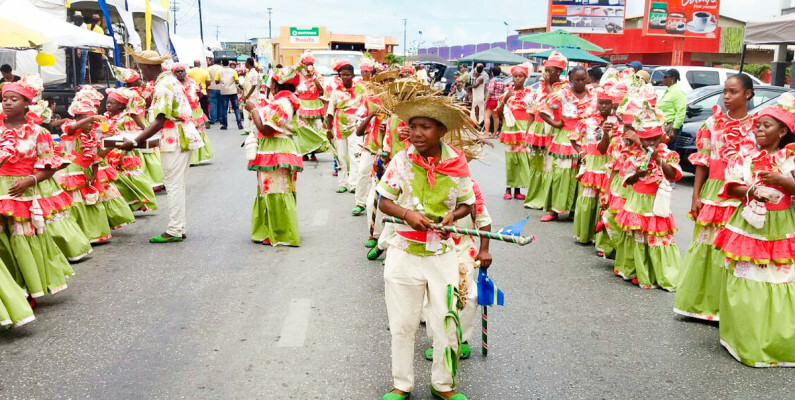 In 2019, the “Gran Marcha di Seú” (Grand Seú Parade) will take place on Monday the 22nd of April, and the “Marcha Seú Banda Bou” (Banda Bou Seú Parade) on Sunday the 5th of May.